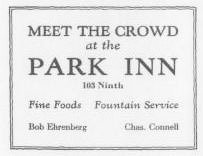 Meet the crowd at the Park Inn. Fine foods, fountain service. Bob Ehrenberg, Chas Connell.